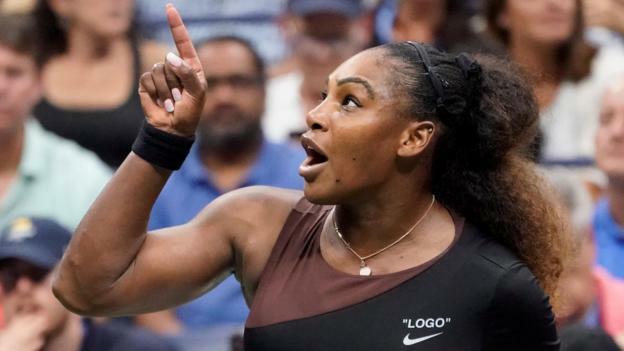 Billie Jean King says Serena Williams was “totally out of line” for her outburst in the US Open final, but also believes umpire Carlos Ramos “blew it”. The American later said it was “sexist” to have been penalised a game. “Serena was out of line, there’s no question,” said legend King. American King, one of the founders of the Women’s Tennis Association (WTA), initially backed the 23-time Grand Slam champion, saying in the aftermath of Saturday’s final: “When a woman is emotional, she’s ‘hysterical’ and she’s penalised for it. When a man does the same, he’s ‘outspoken’ and there are no repercussions. “No one was saying she was a good sport, if they are they’re crazy,” added King, who won 12 Grand Slam singles titles. Williams’ claims of sexism were backed by the WTA, but the International Tennis Federation said umpire Ramos acted “at all times with professionalism and integrity”. “He needed to tell Serena – he can’t apologise he did the right thing there, he can’t apologise, he’s got to be the boss – but all he had to say to Serena is ‘I am not attacking your character’. “Character is the essence of what was going on there, she was so upset about that, those kids (Serena and Venus) have been brought up to play by the rules. The umpire at the centre of the Williams controversy insists he is fine – and says it is not possible to umpire a tennis match “a la carte”. Ramos spoke very briefly about the US Open women’s final to Tribuna Expresso in his native Portugal. He is expected to be on duty as planned for this week’s Davis Cup semi-final in Zadar where Croatia are hosting the United States.